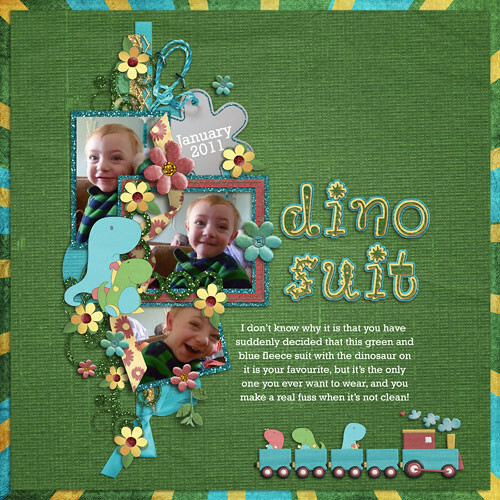 Dino Suit, originally uploaded by Lukasmummy. Credits: Layered template (Template Chat Freebie) by Marshmella Designs and Dino Collection by Joelle Lester (Daphadilly Art). Font is Rockwell. Journalling reads: I don’t know why it is that you have suddenly decided that this green and blue fleece suit with the dinosaur on it is your favourite, but it’s the only one you ever want to wear, and you make a real fuss when it’s not clean!